We are very excited that the New York based animal rights group “The Animals’ Battalion” will be organizing demonstrations in front of the Korean Consulate General’s Office for the third year in a row for the 3 days of Boknal (dog eating is traditionalized in Korea – Chobok 7/12, Joongbok 7/22, and Malbok 8/11 in 2017) and EVERYONE IS INVITED. YOU DON’T HAVE TO BE A MEMBER OF THE ANIMALS’ BATTALION. IF YOU CARE ABOUT THE KOREAN DOGS, PLEASE JOIN. They held 3 demonstrations in the previous two years at the same location and were covered by ABC network news in New York and also South Korea. The third day of 3 demonstrations last year, they had a big breakthrough. Not only did Consulate General Ghee-Whan Kim in New York acknowledge them, but he also promised to deliver their message to the Korean government. Click HERE to see the photos from their events in the last two years. We are so grateful to the Animals’ Battalion volunteer activists who participated in previous years and a special thank you goes out to Noelia and Roberto, co-founders/organizers, of the group! You guys Rock! Thank you! If you are in the New York area, click HERE to follow the Animals’ Battalion for further information about these events. The dates for this year’s demonstrations are Wednesday 7/12, Friday 7/21, and Friday 8/11. Posters and brochures will be provided but homemade posters, props and other materials are encouraged! We also have petitions to be signed and sent to the Ambassador of South Korea. Click HERE for all the upcoming events. Not in New York? You can still join us from the comfort of your home. Join our Phone Blitz and be the voice for the Korean dogs and cats! All you need is compassion and a phone. 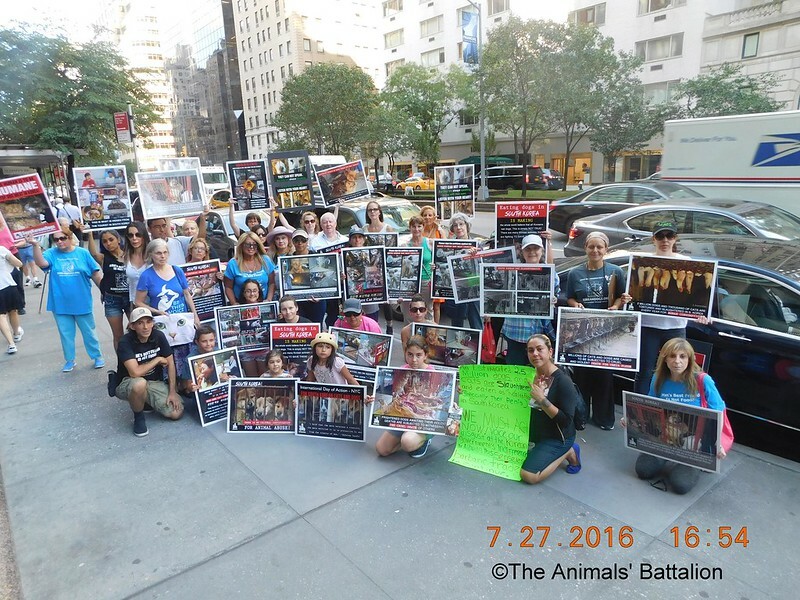 Day 1: The Animals’ Battalion Demonstration on July 15, 2016 at the Korean Consulate General’s Office in New York. Photo: The Animals’ Battalion. 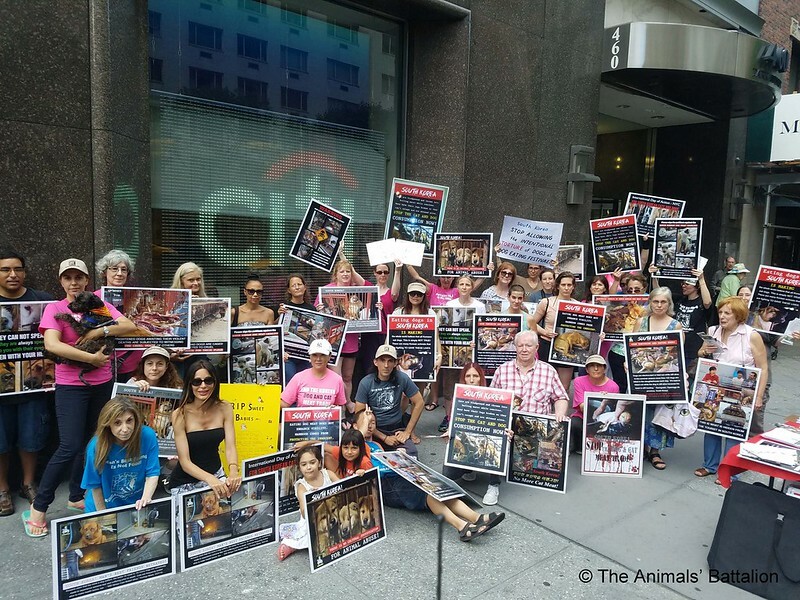 Day 2: The Animals’ Battalion Demonstration on July 27, 2016 at the Korean Consulate General’s Office in New York. Photo: The Animals’ Battalion. 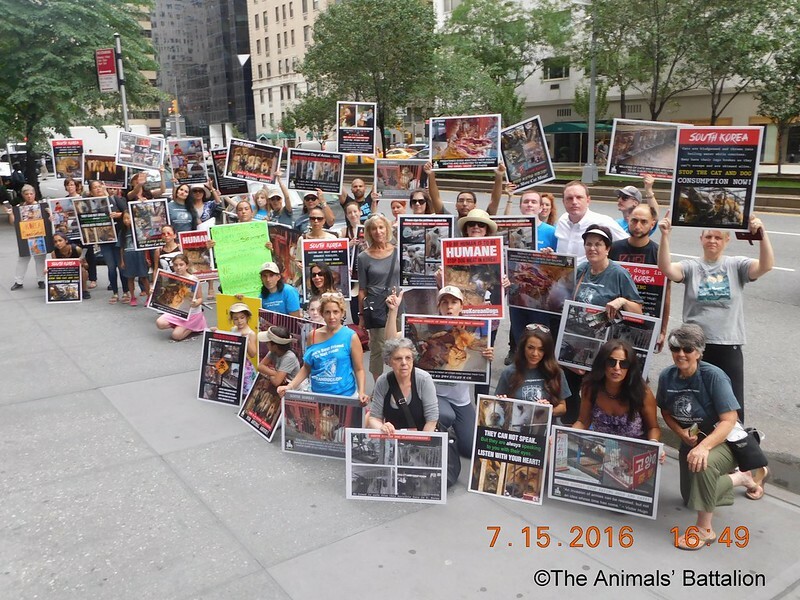 Day 3: The Animals’ Battalion Demonstration on August 16, 2016 at the Korean Consulate General’s Office in New York. Photo: The Animals’ Battalion. Wonderful and good hearted people of New York. I;m with you in spirit and in heart. Excellent work. I want to thank all of the demonstrators for going out and bringing the word that dogs were not to be eaten! That’s not what God put Dogs on this earth for! Dogs make wonderful companions and helpers for many disabled people like myself! They are wonderful animals don’t torture & kill them!!! thank you, for be their voice!! Thank you all for your compassion. I don’t have the words to say how bad I feel but we have to stand up and give a voice to the voiceless. Let’s all keep it up – keep protesting, emailing, calling, using social media and telling all of your friends so this gets the publicity it deserves. All of those poor dogs and cats are counting on us to end their torture and killing. I wish that more media would pick this up so this could get national attention as well! Thank you to all of you for your help!! These dogs don’t have a voice but you do so if you care, you should speak for them. wonderful ! I wish the same would happen in France !!!! France must stand with other countries against this horrendous trade !! Thanks for helping these innocent animals! Thank you all for all you are doing. We must all fight, however hard the way ahead seems, to consign this atrocity to history. It’s easy to become despondent but we must all be determined and persevere and pray that soon the day will come when we will rejoice together. I live in Portugal, and i wanted to be in this event. My strenght, my forces, my feelings are with this people. í´m identified with this people. THIS IS EVIL, SICK, HORRIFIC, TORTURE THAT HAS GOT TO BE STOPPED NOW! THESE ARE DOG’S & CAT’S THAT ARE NOT FOOD, THEY ARE OUR PETS! THEY COULD HAVE LOVING, CARING, SAFE FOREVER HOMES INSTEAD OF THIS SLAUGHTERING THAT YOU PEOPLE WHO INHUMANE DO! THEY CAN BE COMPANIONS TO A LOT OF PEOPLE WHO ARE LONELY. ALSO FOR DISABLED. CHILDREN LOVE DOG’S & CAT’S IT IS PETS TO THEM. LETS SHUT THESE HORRIFIC EVIL FARMS DOWN FOR GOOD! NO MORE PET MEAT TRADE EVER! IT IS GOING TO HAPPEN BECAUSE WE ARE NOT GOING TO LET UP IN OUR FIGHT FOR SHUTTING YOU DOWN! GOD HAS PLANS FOR HIS CREATURE’S THAT HE PUT ON EARTH FOR US WITH THEM TO ENJOY NOT TO EAT EVER! THAT IS JUST SICK! SO LETS START SAVING THESE INNOCENT ANIMALS NOW TO HELP IN ALL WAYS WITH GOOD HUMAN BEINGS! WHO WOULD TAKE GOOD CARE OF THEM, LOVE THEM, BECAUSE THEY ARE OUR PETS! LETS HAVE ALL OF THEM BACK TO US WHO RESPECT THEM & NEED THEM! MORE SO THAT YOU WHO JUST WANTS THEM FOR FOOD! VERY VIOLENT, SICK, INSANE DOING THIS TERRIBLE KILLINGS! it’s so cruel ,seeing this, I am still asking myself, why the politics around the whole world stay without doing nothing !! we know that without their clear position regarding this horrendous situation of these poor dogs and cats, we will have still a lot of work to do !!! these pictures are so cruel, are so horrible, that I can not imagine that the man can do it !! are we in the 21 century ? are we the people who walked on the Moon ? I wonder … The governements, all governements, they all know what happens, and as long as the money is at stake they will do the blind !!! look what happens with the Olympic Games !!!! no one has a courage to say STOP !!! it lasts too long time !!! you must change your behavior with the dogs and cats !!! but no, no one does it !!! too much money could be lost !! and the life of these poor animals seems nothing for them !! what a shame for the humanity !! Thank you, for being the voice of the voiceless. THESE BARBARIC SICK PEOPLE ARE MURDERS ALLOWED TO KILL INNOCENT ANIMALS…OUR PETS WITH EVIL HORRIFIC METHODS. THIS NEEDS TO END NOW! ENOUGH IS ENOUGH! ZERO TOLERANCE! What’s next, killing children for food? GRAZIE PER QUELLO CHE FATE BRAVI!